Weekly highlights from the SmartCash Hive Teams and SmartCash community. The Australian Cryptocurrency hardware provider, CoinStop, is now accepting SmartCash via CoinPayments! SmartCash community members were at ¡VIVA LA CRYPTO! festival in Monterrey, Mexico! Naomi Brockwell interviewed Zaphoid at Consensus in NY. Llambo Llama chatted with SmartCash as well, with the video to be published soon. Ben Swann presented on SmartCash, with a video recording to be released soon. There are presently two proposals to vote on at the SmartCash Governance Portal. Want to be heard? Then vote! Visit the SmartCash Pre-Proposal Forum to share your own ideas and get feedback. Having trouble getting your proposal passed? Try these three simple steps and try again with a revised version. The SmartCash network stress test has started. Miners are now mining 4MB blocks with 55 second average block times. We sent 82k txs in 23 min over 19 blocks. This peaked at 214 txs/s with an average of 59 txs/s. BTC/wSegWit can now process 20 txs/s. Development on version 1.3 is progressing, and will introduce cold voting keys that will be integrated into the proposal system. This will enable secure and simplified methods for Improved SmartRewards. The latest SmartCash Electrum release is getting close! You can see the regular activity on this GitHub. You can keep up-to-date with new developer commits across multiple repositories at https://smartstats.cc/github. Exmo has added four SmartCash pairs to their exchange, including three fiat pairs: USD, EUR and RUB! SmartCash meetups were held in Boston, Nagoya and Kramatorsk among others. Hosting a meetup? 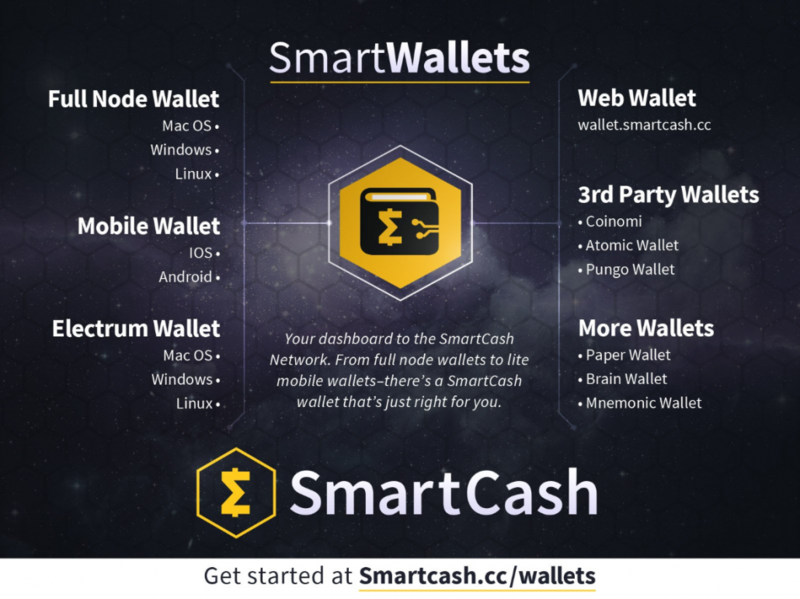 Let us know and it can be added to this SmartCash Meetup directory. Team members shared SmartCash at CoinDesk’s Consensus: Invest event in New York. Attendees visited the kiosk and were intrigued by SmartCash, SmartCards, and SmartCashPay! More ATM networks have added SmartCash! SMART is now available on 3xBit and will be soon integrated into its ATMs in Brazil. SmartCash is now available at 11 bitcsuisse ATM locations throughout Switzerland. Watch a video of the ATMs on YouTube. SmartCash welcomes new Outreach One Team Members in November: Doc and illumin8. Be sure to follow them on Twitter! 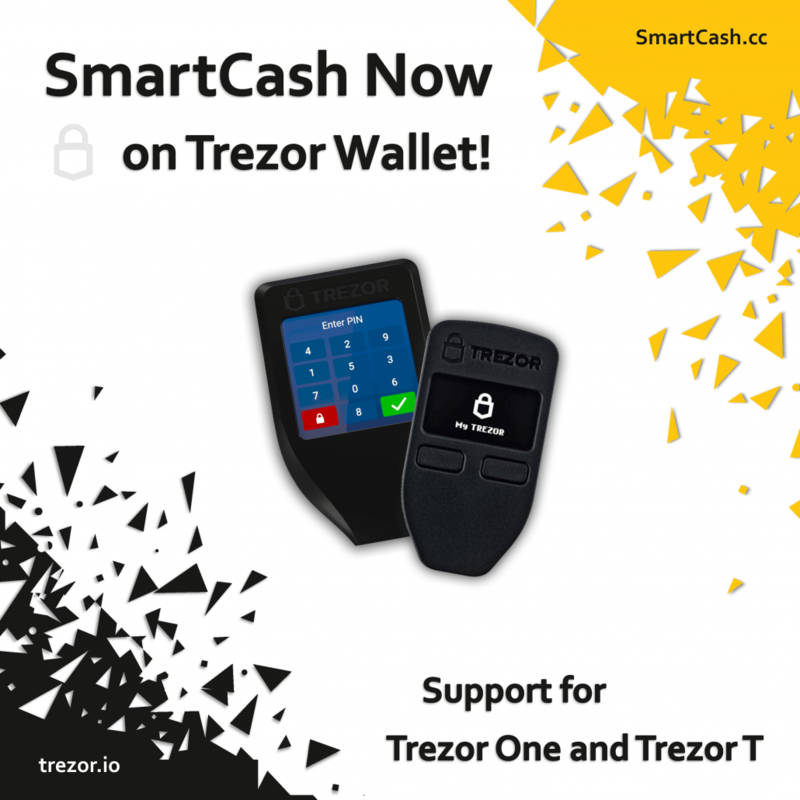 SmartCash is now available to use on the Trezor hardware security device! There is now a very easy and cost effective way to host your SmartNodes at SatoshiSolutions. You can now trade SmartCash using the Coinswitch service. Has the SmartCash stress testing knocked your SmartNode offline? Jump on the SmartCash Discord Channel to have help configuring your VPS for best performance. Nodes can restart if they don’t have enough ram or swap space. Nodes will use higher CPU than normal, but should recover if you have a VPS with enough performance. Some VPS providers will shutdown instances with high CPU usage. It is up to the SmartNode operator to monitor and upgrade servers as needed, but tips are available in the Discord Channel! Remember, the SmartCash treasuries have migrated to spread out MultiSig addresses. This transitions hive budgets to higher security multi-signature wallets, in an ongoing effort to decentralize and further de-risk the storage of SmartCash Funds. Remember, the best place to get support is at Discord, but there are also support articles on common topics on FreshDesk here. Helpful visualizations and other SmartCash Statistics are available and updated regularly at smartstats.cc. Subscribe to the SmartCash Newsletter to receive “Your Week in SmartCash” in your inbox. Looking for the Mailing list? Want to keep up with developments, news and updates from the SmartCash team?